A decision support tool to guide clinical decision making on the appropriateness of re-introducing a chemotherapeutic agent following the confirmatory association between the drug and the occurrence of a serious ADR. Download it from here. Unzip the files to any directory and launch the software using "java -jar PaDEL-Rechallenge.jar" without the double quotes. The model calculates a score (range from 0 to 1) and likelihood of negative and positive rechallenge for a patient. The likelihood of negative and positive rechallenge are the predictive positive value and predictive negative value respectively. 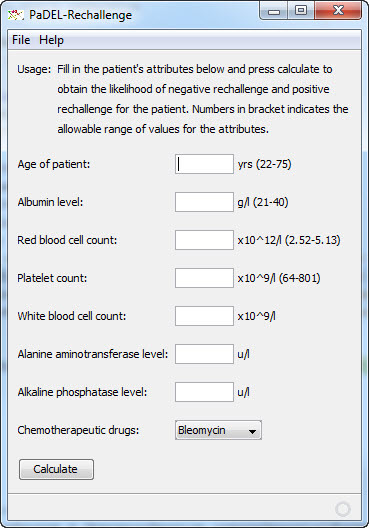 To understand the meaning of the likelihood of negative and positive rechallenge, let's look at an example of a patient with a calculated score of 0.75. For this patient, the likelihood of negative rechallenge is 80%-90% and the likelihood of positive rechallenge is 66.7%-76.2%. This means that if you predict this patient will have negative rechallenge, you will be correct 80%-90% of the time, whereas if you predict this patient will have positive rechallenge, you will only be correct 66.7%-76.2% of the time. Even though it is more likely that this patient will have negative rechallenge, the final rechallenge decision will depend on the intended treatment objectives for the patient. For example, if it is essential that patients are not rechallenged unless it is absolutely certain that they will have negative rechallenge, then this patient is not suitable for rechallenge.